I was happy last week because my spot-sugar was a "normal" (i.e. non-diabetic) value, about 5½ mmol/l (100 mg/dl). (After the last post, I'm going to try to quote both units.) But I observed at the time that a one-off value is just that, and not particularly important except in the context of all my other values. Today, my average sugar - all the readings over the last month - dipped below 9 mmol/l (160 mg/dl), for the first time since I started calculating averages. This is not a particularly significant number in diabetes terms, so again this is mainly me playing with numbers rather than anything significant, but nice to see my average getting lower. I note once again that it takes two insulin injections per day to get to this level. I also measure a statistical property called the standard deviation. It's quite straightforward to calculate, but not trivial. An application like Excel will calculate it for you. It is basically a measure of how much your sugar varies with each measurement. Obviously, if you take one measurement and you're at "really low", and the next measurement at "really high", then you have an average which probably isn't very remarkable, but it'll hide these extreme values. So possibly of a greater cause for note is that I've got this variance down to about 1.4 mmol/l (25 mg/dl). So my average is 8.9 ± 1.4 mmol/l (160 ± 25 mg/dl). In a healthy person, your pancreas produces sufficient insulin that your body's sugar is pretty constant, so the smaller the it varies, the better. For me, whose pancreas doesn't produce enough insulin, 1.4 represents the smallest variance since I started taking measurements back in 2016. Because I take readings every day, I end up with 30 or so per month, so typically the standard deviation will only change by a tiny fraction per day, so it takes a while to notice much difference in the numbers. Side-by-side from my blogging, I am developing a Diabetes Management application. 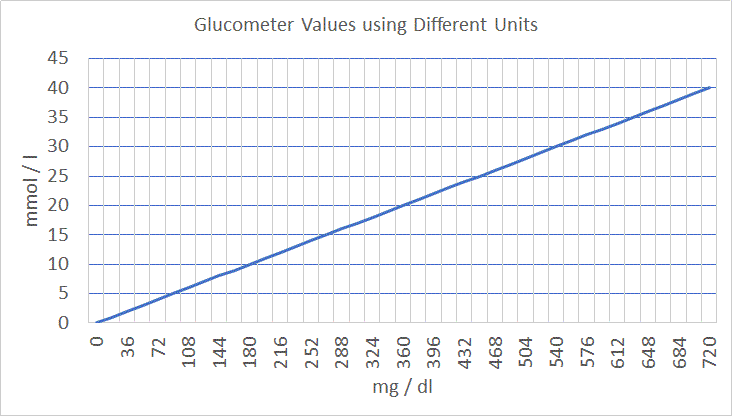 There are basically two different units in use (for glucometer readings) worldwide. 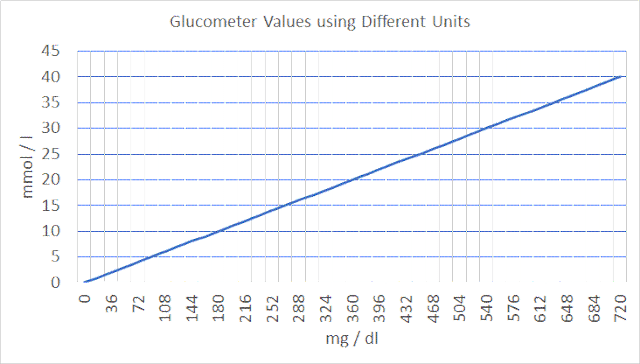 This is not exhaustive but the UK, Australia, China use the units mmol/l. Most of the rest of the world uses the units mg/dl, including mainland Europe and the USA. I'm developing this app, which I want to support both units, so I've read up on both units. But I got to thinking, and my wife confirmed this, that many people, even health professionals, are intimate with the one unit but know nothing about the other. So, to give an example, I've talked about blood sugars of 15 mmol/l in the past (I'm almost half that now!) - this is 270 mg / dl. My current average is 8.9 ± 1.4 mmol/l - I might say more about that in a later post - which is 160 ± 25 mg/dl. So clearly, above that of a non-diabetic, but getting better. As I'm starting to work with this new unit, I'm finding it quite convenient, and in fact I've changed my app to store the numbers, internally, as mg/dl. although, of course, it is just a number. Each number in the database carries with it some crazy-silly precision, so 10 or 200 doesn't make any difference to it. I think I might mention it in one of my Bio entries, but I come from Liverpool, the same place as the Beatles. I don't make a big thing of it - I left at 18, I'm 51 now, so most of my life has been spent away from there. Keen listeners can detect a faint Scouse accent, but that's about it. In truth, as a teenager, Liverpool was a very depressed place, lots of unemployment, and I couldn't wait to start living life elsewhere. As well as coming from Liverpool, I also like the Beatles. Again, nothing special in that, and many of us feel that particular music is directed at us, personally. If anything, my main love of music was Bob Marley, who sparked my love of reggae and of UK reggae bands such as Aswad. I still love that to this day. But getting back to the Beatles, there is a vague family connection. When she was a child, my mum lived at 18 Arnold Grove, a small cobbled street of terrace houses in the suburb of Wavertree. At the same time time, George Harrison lived at 10 or 12 Arnold Grove. This would have been during the Forties and Fifties, before the Harrisons moved to the new estate in Speke. My mum's main memory was that Harrison's mum hardly ever let him out to play! I later read that Harrison often used the pseudonym Arnold Grove in order to travel the world anonymously. In later life, when I was around, my parents moved to the south-Liverpool suburb of Hunts Cross (so, if anything, this is more of my mum's connection than mine) . This was near to Harrison's "new" home is Speke (though this was now the Eighties, when he'd long-since gone), and also not far from one of his later homes in Halewood. It was also not far from Menlove Avenue (Lennon's aunt's home) from Forthlin Road (Paul McCartney's childhood home and a street I had to walk past in order to sign on during the summer! ), walkable to Strawberry Field and to St Peter's Church in Woolton. These places are all quite close to each other in south Liverpool. I walked past them all when I went back to Liverpool as a student - I had the time to walk places and besides, couldn't afford much other transport. I don't pretend that these connections are in any way significant, they're no stronger than anybody else from Liverpool. But certainly anybody growing up in Liverpool was taught that the Beatles were gods, so it is not surprising that I like their music. And George, especially. Yay! For the first time in what must be many years, I measured my sugar this morning and it was a "normal" value - 5.5 mmol/l. It's a cause for limited celebration, as obviously the number is good, but I still need to take insulin to get to that level. But whilst I've always had the attitude "it runs a little bit high, but let's make sure it's not too high", this is the first time for many years that somebody could look at my finger-prick result, and not immediately realise that I'm diabetic. So whilst I've automatically conceded, I suppose, that I can't have "normal" sugar levels, actually, I can! I mean, I measure my sugar every day so I know how much it can fluctuate. So I am just applying logic to it and saying that, in the grand scheme of things, this is just an abnormally low reading in the same vein as the abnormally high reading I got last Saturday (say), so the important thing to watch is my average, not a one-off value. Of course, it also increases the possibility of hypos, just in terms of my sugar going too low. I've tended to avoid them mostly because I do let my sugar run slightly high, but if I'm down in the realms of the 5s and 6s, there is absolutely no reason why it can't go just little bit further, and go dangerously low. I need to watch out for that, although I do know what a hypo feels like so I should be able to notice if one comes on. It does make me think, though. Just in terms of the sugar, the stroke, etc. I face this monumental battle each day, counting pretty much every scrap of food that I eat, whereas other people can just get away with eating whatever rubbish takes their fancy. You can't go through life moping "why me?" but you can't help wondering sometimes at what might have been. I've tried to guard against hypos by immediately reducing my insulin dose, only by 5%. Let's see what my sugar is doing when I'm next fasting. Even if it does go high again, that small amount of difference in insulin must mean that it can't go too high. We were used to drama over Christmas when daughter lived at home. These ranged from visits to A&E - for example, she would claim to be in agony yet the medical people could find nothing wrong, so you never knew what to think - to visits from the Police, either when she was thought to have done something, or when she'd decided to stay out all night. Even though she has now left home, the crises haven't totally gone away. I mean, it is better now since we (the parents) are not directly involved, so ultimately we can shrug our shoulders, but it is nevertheless exasperating - my wife and I have over a century of life experience between us, yet daughter insists on making every mistake for herself. This time, it is her motorbike. A brief history - daughter couldn't wait to get a bike and bought her first off a private ad on gumtree or somewhere. The bike duly turned out to be a dud. A potential lesson there? My own feeling is that you buy from somebody who works for a business servicing bikes for a living. Because it is highly probable that they don't want an angry punter banging on their door a few days later, so it has likely been serviced before it was sold. Plus, if this guy does a good job, they have automatic repeat business. With a private sale, there's none of that, everything is "as seen" so if you're unable to see that the bike has a problem..... Sure, you'll pay more through a dealer, but that's because a lot of the risk shifts their way. Plus, of course, I never had any idea how motor cars worked, but I found people who could be trusted to do a good job. So, daughter buys a duff bike privately. Does she learn? No. She now had a second bike, also bought privately. She has only just got the thing back onto the road after some other problem, but she rode to our place just before New Year's - the thing kept slipping out of gear and was losing gearbox fluid. Daughter has said to me that even an expert in bikes (she's far from that) wouldn't have spotted this problem without getting dirty with the engine, and that despite this, the seller was a good guy. So she poo-poo'd my suggestion that this guy had seen her coming. In any case, it misses the point, because a reputable seller would not have allowed this to happen - they'd have their reputation to worry about. So at the last count, daughter is facing some time off the bike because she can't afford to get it fixed yet. The immediate effect was that she had to use public transport to go to Bournemouth on New Year's, and I know myself how much more inconvenient that is. As I said at the top, I can afford just to shrug my shoulders here (mostly, although I think the money for this bike came out of my wife's pocket and I worry that she isn't getting a good deal). I'm past the stage of getting upset when I mentioned that the seller probably saw her coming, past getting upset that she assumes he's a stand-up guy, and I'm the idiot for even making the suggestion. It is a shame that whatever I say counts for nought, but I've had this since early teens, so I'm used to it. I'd like to wish everybody who reads this nonsense all the very best for 2019. Life is fleeting so, please, don't take it too seriously.